Find the Right Colleges. Improve Your Odds. MyKlovr is a virtual counselor for college bound students. We utilize artificial intelligence and data science to provide personalized college counseling and the very best tools and resources to help students maximize their chances of college admissions. ‘how will I be able to afford to pay for college?’. Your high school guidance counselor is not available at all hours to answer your questions and help you through the process of preparing for college applications even on the weekend, but myKlovr is. Our assistance and resources aren’t only helpful to the students we are advising, but to the parents who are not sure what to do next, and the college counselors who may have more students to advise than they can handle. 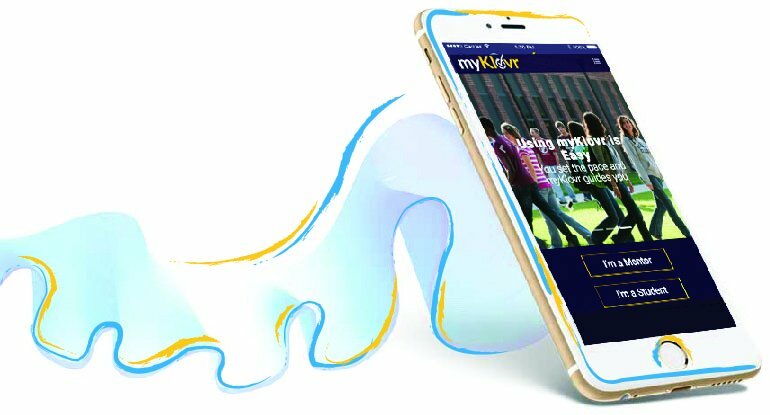 Available as a mobile-friendly website, myKlovr is the virtual guidance counselor that helps you become the best you that you can be. Tell us about you. This allows myKlovr to provide you with personalized recommendations. Discover colleges that fit your profile and build your reach, match and safety college lists. MyKlovr recommends areas of focus and resources to help increase your chances of getting into college. Your parents can support you. MyKlovr helps you track your progress so you always know where you stand with tasks you need to accomplish. 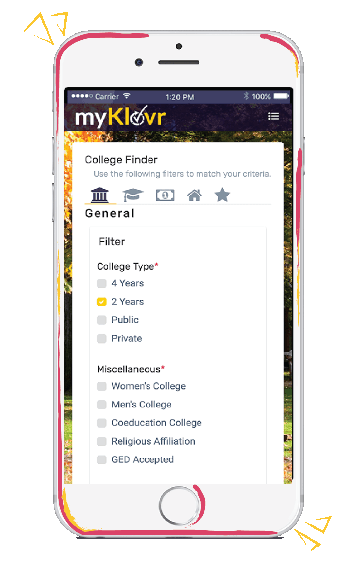 MyKlovr’s artificial intelligence engine will work with you to identify the best-fit colleges for you, develop your college application plan and establish a roadmap of goals and milestones for you to increase your acceptance chances. MyKlovr is fully committed to making your journey to college a success. MyKlovr College Acceptance Promise is made possible by the first-ever educational, contractual liability insurance policy that AXA XL Insurance designed specifically for Student Global LLC. Learning is a lifelong endeavor. MyKlovr is an artificial intelligence enabled college advisor that helps you break down your journey into personalized goals and increases your chances of getting into the college of your dreams. MyKlovr’s virtual counselor helps unlock your full potential. Start with a comprehensive student portfolio. At the end of your college preparation, your myKlovr profile becomes your showcase college application portfolio. With this advanced college finder, you will find colleges that best match your profile and meet your expectations. Build your reach / match / safety college lists and receive college prep guidance relative to your college choices. Every college bound student's learning needs are different. Your virtual college counselor offers you Personalized Artificial Intelligence Recommendations based upon your capability and your college preferences. The myKlovr virtual counselor accompanies your planning and execution step by step, nudges you when necessary, and provides insightful yet comforting help as you clear hurdles on your way to college admissions. Paying for college is a major concern for most families. Find out how you and your parents can prepare financially so that you can afford the best possible college for you. Learn about available financing solutions and how to use them. Need help achieving your goals? There are plenty of resources available out there but choosing those that are right for you is not easy. The myKlovr Marketplace will soon suggest educational goods and services relevant to you. Parents can connect with their children on myKlovr. Soon the myKlovr Mentors network will also bring together in one single location school faculty, tutors, etc. to support students, provide input, feedback, endorsements and encouragement. Keeping in touch with others who can offer assistance and advice keeps the student motivated during the daunting admissions process! Create your college application portfolio and soon share it with your Mentors and colleges. Get insights from our college database and use our tools for personalized recommendations. Review your goal recommendations, set up your action plan and soon involve your Mentors. With an innovative and flexible approach to risk solutions, AXA XL partners with those who move the world forward. We have created insurance products that enable sharing economy companies like myKlovr as part of their customer value proposition. We believe that the tailored contractual liability insurance that we designed for myKlovr – a first in the educational industry – is a game changer and a preview of things to come. 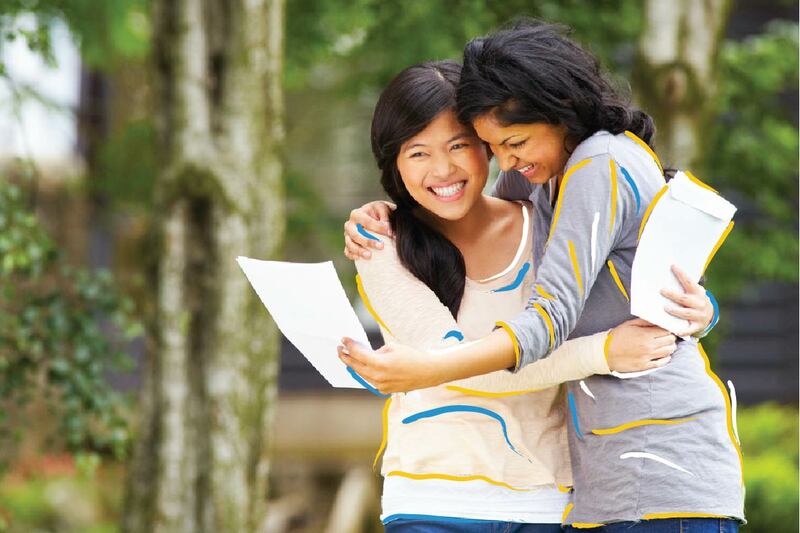 This policy enables the myKlovr College Acceptance Promise – a money-back guarantee – and is an additional source of assurance, a great complement to the myKlovr virtual college counseling and helps Student Global LLC further expand the value that they offer to families through their unique after-tax employee benefit. By simplifying a process that has been traditionally confusing and expensive, myKlovr delivers a one stop shop solution for companies and employees. By providing employees with an employer offered benefit, which maximizes their families’ probability of getting accepted into the college of their choice, myKlovr has enabled companies worldwide to win the fight for talent, by attracting and retaining employees. And since the benefit can either be employer paid, as total rewards, or employee paid, as a voluntary benefit, there is absolutely no downside to either party. Best of all, through their deal with AXA, myKlovr offers a 4 year money back guarantee on their benefit. It's a game changer and truly establishes a shifting paradigm in the college prep process. Getting into college has never been so easy, fun, and affordable! Start early. Your college preparation will be easier, and your student profile will have time to exponentially grow, transforming into a gem of a college application.